The judge’s comments are part of increased media coverage as the state budget process nears its annual decision-making point. Read the story here. The news services added that “the most populous U.S. state joined nine others and the District of Columbia in granting licenses to drivers regardless of immigration status, a controversial move that marked a significant shift in policy toward immigrants in California.” The lack of a driver’s license has long been a problem in the Golden State, prompting some cities to issue their own forms of ID. Between 2 million and 3 million unauthorized immigrants are believed to live in California, making them the nation’s largest such population. 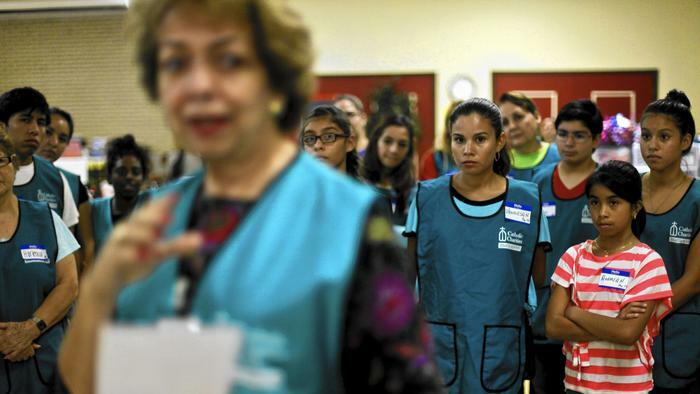 Immigration courts, meanwhile, face a backup of some 400,000 cases. Such cases are civil, not criminal, proceedings. To read more about the driving issue, click here. The report is likely a game-changer because it documents the range of outcomes under a “single federal system,” which illustrates it’s anything but a single system. The research compares and contrasts outcome, documenting that “… the number of removal and voluntary departure orders in Texas and North Carolina was 3.5 times the level in California and Florida. Not that anyone knows much beyond those orders. The Times notes that immigrant advocates say many of those children were never notified of their hearing date because of problems with the immigration court system. Times sources say that some notices arrived late, some went to the wrong address or perhaps there was no notice delivered at all. Those sources also say some children were ordered to appear in a court where they were initially detained, not where they are living now. Also, nobody really knows how many of those children choose to just not show up for the hearing, or how many were actually notices. “What was a border crisis has now become a due process crisis,” said Wendy Young, president of Kids in Need of Defense, an advocacy group, in the Times report. Oh, and it is also not known how many of those children facing deportation orders have been sent home – you have to wonder if they even know the hearings happened. Read more on the mess at the Times. A Los Angeles Times report highlights efforts of a Lutheran church group becoming de facto court watchers to make sure the “border kids” – those under-18 would-be immigrants from countries other than Mexico who recently flooded into the U.S. – understand their rights under American law. Advocates say the Justice Department courts that review cases are wildly uneven and outcomes depend largely on legal representation. Those charged in the courts do not have a right to an attorney because the cases are considered civil actions.